So I did either a smart or stupid thing depending on your point of view. We went to the local grocery store this evening for some chicken. 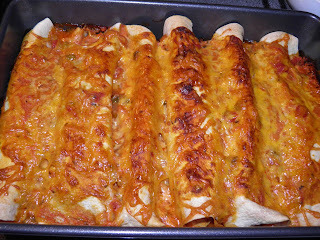 The recipe I wanted to make was chicken enchiladas. But we came home with a 5.5 kg turkey. It was on sale for $0.99 a lb. Unheard of price at any time of year so we couldn't pass it up. Yes, we came home with 12-1/4 lbs of turkey. What were we thinking? You see, we have no room in the freezer. So this week steel yourselves. There will probably be some creative ways of using turkey coming in the near future. I know some of it will end up in soup for certain. 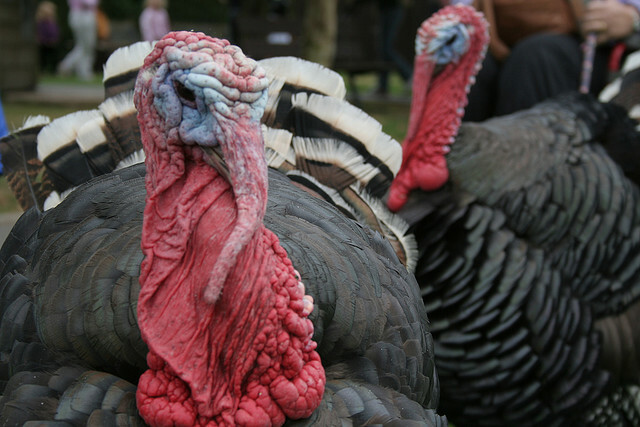 Turkey is actually a very good meat to include in your diet. It is naturally low in fat. 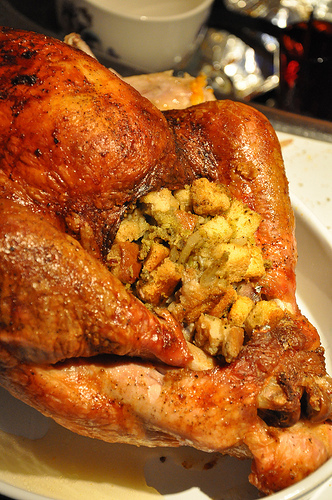 About 1 cup of turkey has half of the recommended daily allowance of folic acid. Not only that but it is good source of vitamins B, B1,B6, zinc and potassium. Studies have shown that they help keep blood cholesterol down, protect against birth defects, cancer and heart disease, aid in nerve function and growth, boost the immune system, regulate blood pressure, and assist in healing. 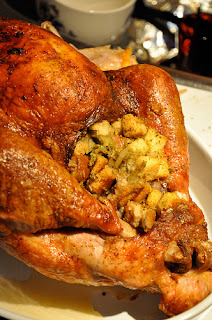 Turkey does not make you sleepy after a Thanksgiving dinner. It's the effects of the entire feast, not just the trytophan in the turkey. Chicken, pork and cheese have as much trytophan as turkey and no one ever says they make you fall asleep. As an important aside, NEVER stuff your turkey until it is ready to go into the oven. 90% of poultry has salmonella bacteria on its skin so care must be taken to not cross contaminate your prep surfaces, knives or other ingredients you may be using in the rest of your meal. Cooking turkey to the proper temperature (180°F) helps mitigate risks from salmonella. So now that I have you scared, let’s proceed on to make some enchiladas! You will also note I’m trying something new with my recipes. After the preparation directions I’ll be putting my best guess at the Canada Food Guide serving information present in each recipe. It’s not gospel, but it’s close. 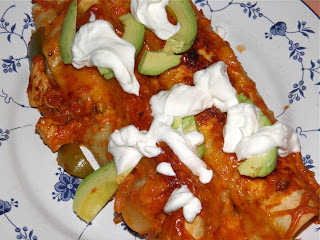 Topped with sour cream and avocado. Preheat the oven to 375°F. Heat the oil in a large skillet. Add the onion and sauté until softened. Add the turkey and cook until almost cooked through. Add the green pepper and 1 cup of the salsa. Add some salt and pepper and the cumin and oregano. Stir well. Let cook for about 3-4 more minutes. This is your filling. *If you want to extend the filling to serve 4, add 1-1/2 cups drained and rinsed black or pinto beans for more protein and fibre, and divide between 8 tortillas. You can also add 1/2 cup of chopped pineapple for a tasty variation. Mix the remaining 1-1/2 cups of salsa with the buttermilk (or sour cream). I suggest light sour cream as an alternative because it is thinner than full fat sour cream and many people don’t want a full litre of buttermilk hanging around in the refrigerator. The end result regardless of your chosen ingredient is to make a sauce able to be poured. Coat the bottom of a 9” x 13” with about 1/2 cup of the salsa/milk mixture. Place 1 tortilla in the pan, add 1/6 of the filling and roll up, turning to put the seam side down. Repeat with the rest of the tortillas and filling. 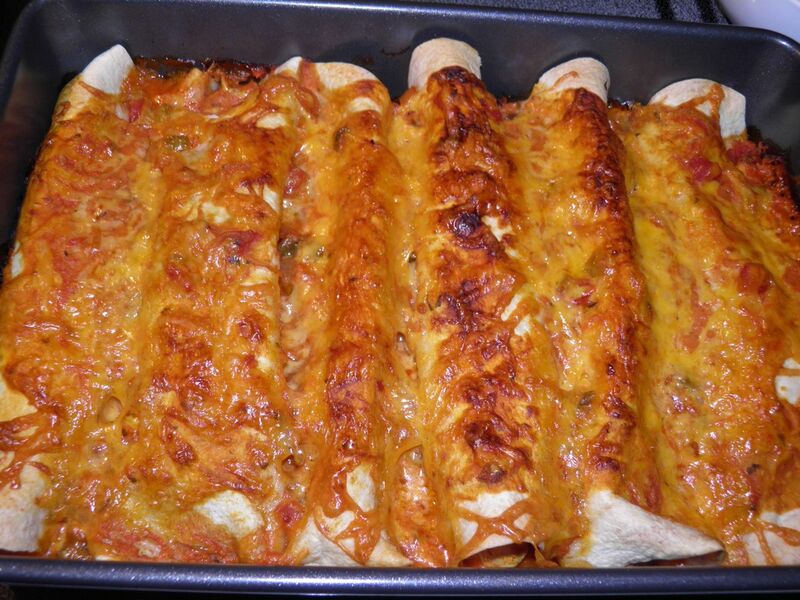 Pour the remaining salsa/milk mixture evenly over the rolled enchiladas. Top with the cheddar and bake for 30 minutes. Let cool for 5 minutes because the filling will be piping hot direct from the oven. 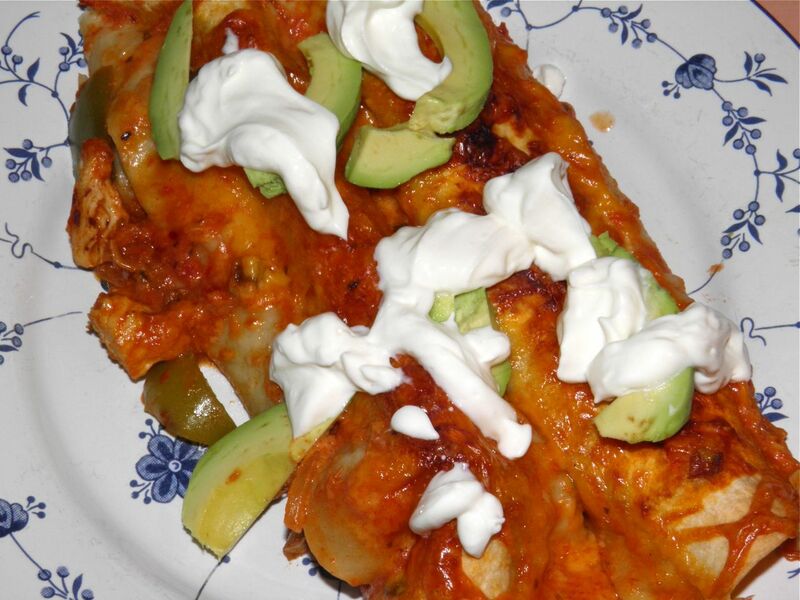 Serve warm topped with sliced avocado and sour cream, and jalapenos if desired.